The applications of artificial intelligence and machine learning technology have started to see the light of day at an accelerating rate and showing signs of great economical impact. Accenture Research and Frontier Economics published a report last year showing that AI will increase economic growth by an average of 1.7% across 16 industries by 2035, with Information and Communication leading all industries. You may have already heard about how Amazon.com uses smart algorithms to suggest new products to you, or how social media sites do the same to offer targeted advertising or to tailor highlights for you on your timeline. How about virtual assistants, self-driving cars or package delivery using drones? The truth is that AI is no longer something we speak of as the future—its different applications are already here in the present, either already rolled out or in the process of being tested, refined and ready for the marketplace. Forbes has a nice list of popular examples of AI in use today if you’re interested in learning more about what is already out there. Where it gets particularly interesting for us is what AI can bring to organizations through the role it can play in the digital workplace as typically (and rightfully) represented by the organization’s intranet platform. 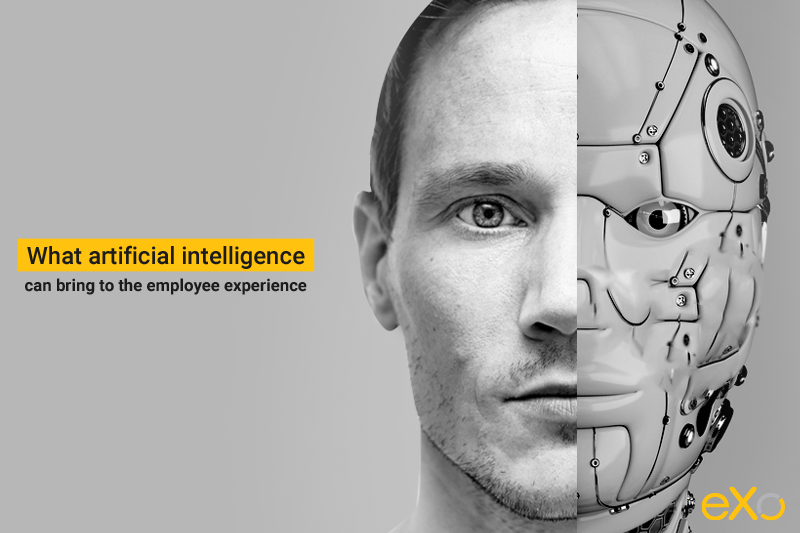 This is currently a hot topic for us at eXo and for our peers, the main question being not if but how AI can be implemented therein and what value should it bring to the employee experience. Below are some of our thoughts on three possible worthy implementations of AI in a company intranet. These thoughts are likely to drive future decisions we make for integrating AI technology into eXo Platform. They may also hopefully provide you with some food for thought in regards to the role that AI can play in the future iterations of your digital workplace, regardless of what technology you base it on. First, let’s look at what chatbots are. A chatbot is a virtual user that simulates conversation with human users within an instant messaging application. Today, chatbots are typically implemented for chat software providers like Skype or Slack to provide virtual assistants therein or as a way to integrate third party software in a conversational format. Chatbots are also offered today by some B2B customer experience software providers that allow businesses to integrate a chatbot to their websites that help guide their visitors. Some chatbots can leverage an artificial intelligence engine under the hood enabling it to offer answers or take actions like searching the web or a knowledge base, fetching data and insights and presenting it to the user who requested it. Machine learning technology would allow it to improve the quality and relevance of its answers over time based on a set of factors. So why would we want to leverage AI in the form of chatbots in the context of a digital workplace? First because they simply fit well within chat systems. 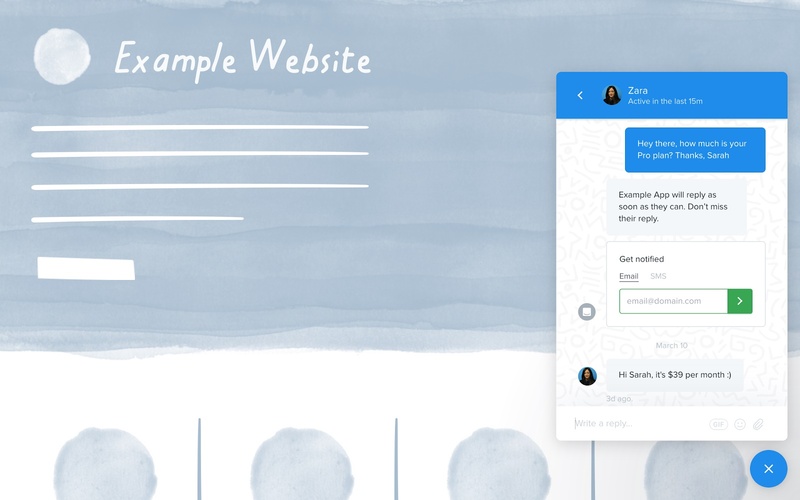 While we do not believe that a chat app is a substitute for a streamlined intranet experience (mostly for knowledge management reasons, more on this in future articles), we do believe that every intranet needs a smartly integrated chat app. Either way, a chatbot would fit right into that. Second, it’s the form factor: AI is inherently intricate. But it’s supposed to make life easier to end-users so its user experience needs to be as simple as possible. Chatbots are a good UX form for tapping into AI because they are conversational and rely on natural language. No tons of buttons or forms are exposed to the user, but simply a virtual person that you can chat with. First of all, what does social network functionality have to do with a company intranet? Enterprise social networking is a great means to an end, at least that’s how we at eXo view it: It’s a way to build a user-centric experience by providing a friendly and conversational medium between the user and all of his collaborative work updates, content, knowledge base and business apps. It’s here to help collaboration by accelerating access to relevant people and information (of different kinds and from different sources) as well as improving user adoption. That’s why eXo Platform is not a social network in and of itself, but instead is a set of collaborative applications (spaces, documents, chat, wiki, tasks, forums, calendar, content management, etc.) glued together within a familiar social network type of user experience. To see what AI can bring to improve that experience, we could look into how AI and machine learning algorithms are being leveraged today in successful mainstream social network sites and messaging applications, and how that could translate to a private social intranet context. One challenge with social networks and messaging apps is how to deal with the amount of noise that gets generated in purely chronological news feeds or chat threads. This can become a concern particularly in well-adopted systems where lots of activity is taking place (which of course is a healthy sign per se but can start to interfere with how easy it is to focus on what matters the most). Facebook has an algorithm for showing “top stories” to the user in its news feed based on several factors. Users of Slack, which is strictly a chat application, are also known to struggle with things being easily lost in endless conversation threads. This is why a new “highlights” feature has been introduced a few months ago, leveraging artificial intelligence to try to show important messages to the user. In eXo’s model of a collaborative intranet where the social network and chat threads are not where the actual work happens but instead are an interface to the knowledge base, this challenge is less critical. Still, we can see value in intelligently highlighting information to users based on a cumulative understanding of their behavior inside the platform. E.g. users who might be members in many workspaces but are most active in just a few might need to have their activity streams somehow highlighting information from those sources. Offering smart/adaptive suggestions of sub-communities and people to promote internal discovery. Offering smart content suggestions to users based on factors like what content they access or ask about the most. Other possibilities and use cases might involve methods for tapping into collective intelligence and crowdsourcing of knowledge within an organization. For instance by providing an AI-powered Q&A system that automatically forwards new questions to people in the company based on their area of expertise and/or previous contributions. It can then offer the best answer obtained to the user and then continuously learn from how useful the user marks the answers so it can serve similar future questions asked by users better and quicker. Another area that can surely benefit from artificial intelligence is enterprise search. Ensuring that users of a large organization-wide knowledge can search and almost always find what they’re looking for easily is tricky business. There is hardly any magical “one size fits all” solution to this no matter what marketing on the topic might claim. This interesting recent article on whether AI will rescue enterprise search exposes the reality of large scale enterprise search and concludes that, while AI will certainly improve it, there is still no clear way of it allowing to reach that ideal solution either in its current level of development today, but this will eventually change. We tend to agree. In the context of a collaborative knowledge base, the improvements that can be achieved would be around things like smart suggestions and prioritization of search results based on factors like the content that users are consuming the most, the outcomes similar previous searches done by other users and what results they have potentially ended up accepting, the past behavior or collaborative habits/profile of the user, etc. Most things that we see AI helping improve at work seem focused around knowledge management challenges and bottlenecks. I.e. improving access to information and answers to questions, to relevant work activity, to other experts in the organization, improving enterprise search, helping navigate through conversational noise, helping internal discovery and innovation, etc. These are all about bridging the gap between the user and corporate knowledge. This may probably seem self-evident to some, but AI is here to improve the user experience, not complicate it. E.g. a misleading virtual assistant is worse than no assistant at all. AI needs to reduce the number of clicks required to do something, to stay out of the way of the user toward his end goal. It needs to do the heavy lifting for the user, otherwise there would be no added value behind it. AI is not here to replace or overlap with existing digital workplace functionality. For example, the job of an AI-powered chatbot should not be to search for things and show results to the user, there is a search engine for that. If the search engine is not working as expected, then it should be improved in itself. So it’s important to carefully choose which gaps need to be filled by AI implementation. AI should bring a next generation of value to a company intranet that is otherwise obtained by existing functionality or by improvements thereof. Naturally, there should be other areas that could benefit from artificial intelligence in the future, such as introducing predictive analytics to a company’s intranet usage and engagement tracking in order to take actions for better engaging internal communities not after but before dips and disengagements happen. Machine learning allows computers to discover hidden or complex patterns in data without explicit programming. The impact this has on the business is tremendous—it accelerates and augments insights discovery, eliminates tedious repetitive tasks, and essentially enables better outcomes. Thank you for the article.